This small town, nestled in the foothills of the lower Himalayas, is where I’ll spend the remainder of my time in India. When I began the internship, six months seemed like a long time. Now, with only two months left before I return to Canada, I am becoming increasingly contemplative as time seems to slip by more quickly every day. The internship has not gone as planned. I was supposed to work in Bhutan for six months. Instead, after two months of waiting in India, delays, reapplications, and dashed expectations, Bhutan rejected my visa application. I must say that this was not the fault of the Bhutanese partner organization, the Canadian organization I work for, or anyone else. Eric showing how to make a loon call during a youth education workshopIt was a bureaucratic screw-up that could not be resolved. A fluke. It might be easier if there was someone to blame. It would be easy to be resentful. But I cannot think that way. It would be a disservice to the friends I have made, the organizations I have worked for, and would only hurt me. An introduction to Buddhism session during a youth education workshop at Deer ParkI have been blessed that while I was waiting for my Bhutanese visa, I lived in the heart of the Tibetan exile community. I worked closely with Tibetan monks and refugees who, in the face of incredible adversity, remain positive, motivated to learn, and actively preserve Tibetan culture and language. 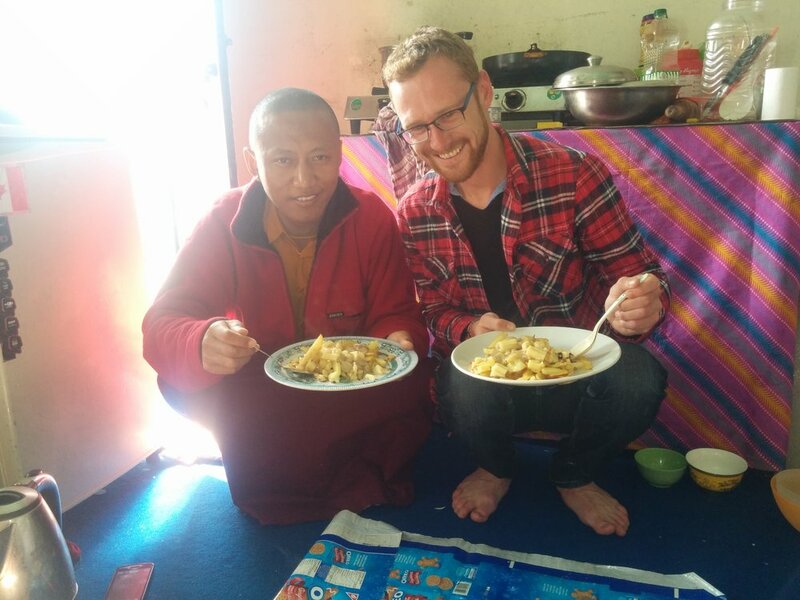 My friend Lobsang and I cooked our national dishes for each other. Over momos, thenthuk, and poutine we talked about how while it may be difficult to live in the present, it is pointless to live in the future, and impossible to live in the past. Eric and Lobsang Thinley, a Tibetan monk he tutors, enjoying poutine and momosOver the last 4 months, I have been forced to give up my expectations, hopes, and predictions. Instead, I had to focus on making the most of each day. I have finally settled down with a host organization, the Deer Park Institute. We have a very busy two months coming up – running educational youth camps for disadvantaged children, researching pesticides and millet production, setting up monitoring and evaluation processes, and participating in conferences on education and sustainable tourism. 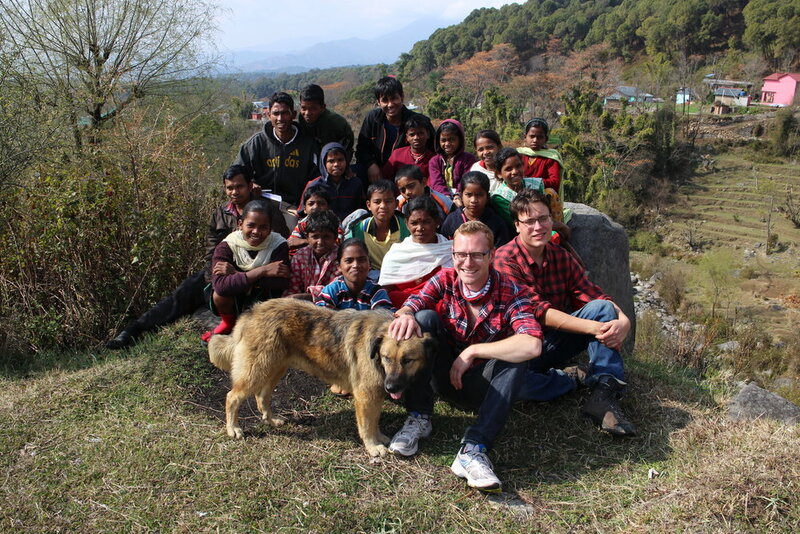 Exploring the local village during an youth education workshopIt might go according to plan. It might not. But I’ll live every moment in the present, making the most of my remaining time here.